It would seem to me there has hardly been a time in the life of Ray Austin when he could take something apart, put it back together again, and it worked better than it did to begin with. Ray seems to have been blessed with natural abilities when it comes to not just mechanical skills, but building skills too. It’s also my opinion that Ray wasn’t cut out of the same material as most young men were who grew up when he did. Not many fellows his age could say they had their own business going during their junior year in high school. Here’s a look back at the growing up years of a fellow who wasn’t always able to attend school because he suffered from bouts of asthma. This illness often made it necessary for Ray to sometimes have home bound teachers. Mrs. Jessie Ledbetter and Miss Nina Gore were two teachers who came to the Austin home when Ray couldn’t go to school. 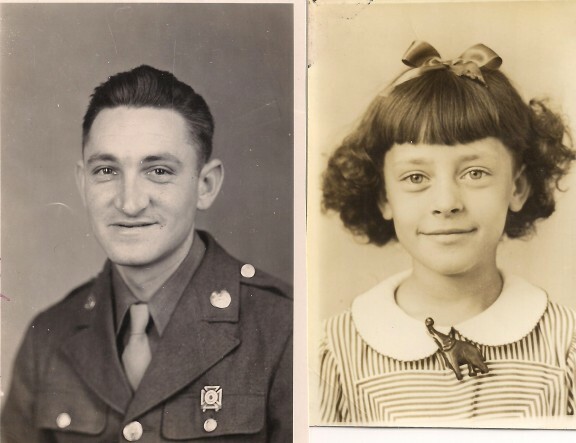 Ray’s parents were John Price Austin and wife Mae Vaughn Austin. John Austin supported his wife and children by working in the coal mines, logging, and farming. Ray had two older sisters, Anna Lee and Barbara. The Austin family lived near the steel bridge in the Allred community. Ray attended Shiloh school his first year, and then around the year 1947, his father bought some property on Woodland Street in Livingston and moved the family into a home he built there. That area of Livingston was just beginning to be subdivided. The home, that presently is the business office of Teresa Richardson, had electricity, but no indoor plumbing. Later, John Austin built a second home just a couple of lots up the street from their first home. It’s the brick home that Carlos Lee and his wife owned some years later. There were very few houses in that neighborhood during the late ‘40s and early ‘50s. Luther McCormick lived up the street from the Austins and had a barn at the back of his property. Mae Austin kept her cow in the McCormick barn. One of Ray’s memories about Luther McCormick was the fact that he used red cedar to make his bean sticks out of. Front row: John, Ray, and Mae Austin. Back row: Barbara and Anna Lee Austin. The first refrigerator the Austin family had was bought from Bush Taylor. That same refrigerator had an extremely long life and never needed to be repaired during the years it was used. The first car the Austin family owned was a 1936 Ford coupe Ray’s father always told he won shooting dice. When the family went anywhere in that car, Ray laid up in the window behind the backseat. 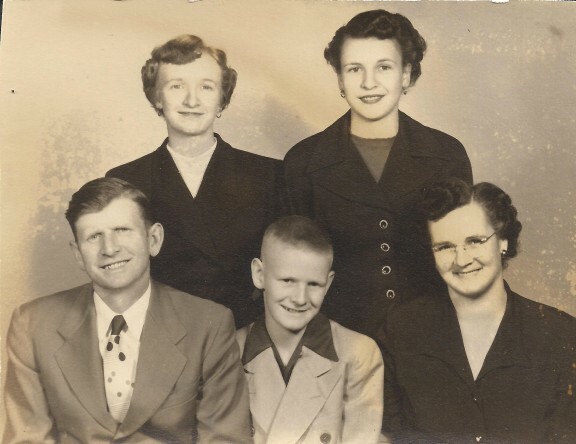 Once on a family trip to Mae Austin’s parents’ home in Jamestown, John Austin had to deal with not one, not two, but nine flat tires on that outing. When the tire went down that last time, he gave up and drove the family back home without ever reaching their destination. Ray explained to me each time his dad put a patch on the tire that went flat, after driving for a while, the patch would heat up and come off. That accounted for the nine flats they had that day. And it was a major undertaking to get the tire to the point of putting a patch on it, but after the ninth time, that was time to say enough is enough. Woodland Street was still just a gravel road when the Austins first moved there, and during the time water lines were being laid in that neighborhood, Ray received the first of two very serious injuries. The first one happened as a result of falling into some of the pipes that had been placed on the side of the road for the water project. The injury was to Ray’s right elbow and was so severe, Dr. H.B. Nevans told John Austin that more than likely Ray would never be able to fully use that arm again. But Dr. Nevans didn’t realize what a determined young boy he was dealing with. Ray’s arm was placed in a cast, and after it was removed, he began putting gravel into an eight pound lard bucket that he used to do what we know now as physical therapy on that arm. He proved Dr. Nevans wrong, and even though the arm did not heal properly, Ray did regain almost full use of it. He told me he sure had put a lot of miles on an arm he was told he might never use again. The second injury happened after Ray got a new bicycle from Smith-Winningham Hardware store on the square in Livingston. He had taken the front tire off the bicycle to put a basket on the handlebars, but didn’t get the tire tightened back really good, and while riding down the hill from Luther McCormick’s house one day, the tire came off and Ray was thrown over the handlebars. When he hit the ground, his head struck a rock that resulted in a very serious head injury that could have easily killed him. A large scar and an indentation in his skull is quite obvious even today. 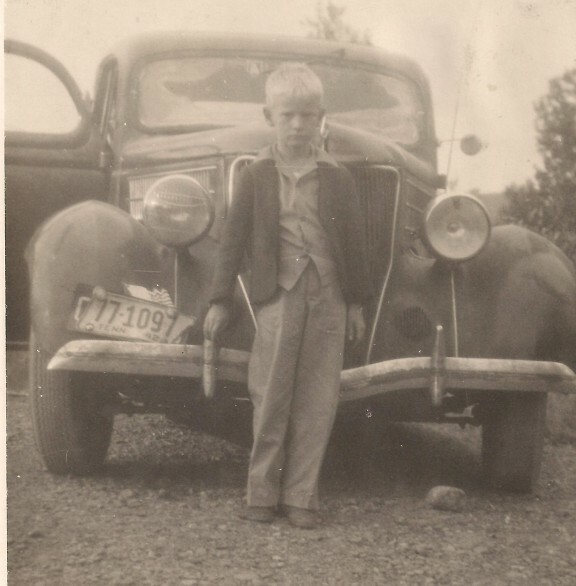 Ray Austin's love of automobiles started at a very young age. He posed here in front of his father's car. One of the first jobs Ray had that he got paid for was carrying out groceries at Nelms Market on East Main Street. He remembers being paid fifty cents every Friday while he worked there. At that time, Nelms Market sold oranges two for a nickle, and many times Ray took his lunch money and bought oranges with it instead of eating in the lunchroom. He would sometimes take the oranges back to school with him, but sold them to his classmates for a nickle apiece. The first car Ray bought cost $75.00 and was a 1930 Model A Ford. He was in the eighth grade when he bought it. Later, he bought a 1941 Ford and took it apart to rebuilt the Model A. He drove it to high school, even though it had no hood or floorboards. On days it started to rain, Ray would often ask the principal at the high school, Kenneth Stephens, if he could leave early so he could get his car in out of the rain, otherwise it wouldn’t start. For a while, Mr. Stephens allowed this happened, but it got to the point he insisted Ray at least get a hood for the car so he wouldn’t have to leave school. Ray recalled the time his father took the family to Nashville to Jim Reed’s Chevrolet to buy a car. They came home with a 1952 Chevrolet listening to the radio on the way back, something they had never experienced before. It was that same car Ray was allowed to take out one Halloween. One of his friends who was riding with him that night started to light a cherry bomb and throw it out the window. What he didn’t realize was that he hadn’t rolled the window down. The cherry bomb exploded in the car and tore a hole in the seat. Ray said he knew he was really going to be in trouble when he got home. One good lesson Ray remembers his father teaching him was when they were hauling coal to all the schools in Overton County. A delivery needed to be made to Rickman school, and Ray was going to take it. His father told him to stop on the square as he started to Rickman and get somebody to go with him to help unload the coal and pay the person a few dollars. This was a job that was done with a shovel, but Ray got the idea he could make some extra money on this trip. Instead of asking someone to go with him, he went alone and unloaded the entire truck of coal all by himself. When he got back home, his father asked him who he got to help him and he told him he didn’t ask anyone, he did it all himself because he wanted to make some extra money. When Ray’s father heard this, he told him he wouldn’t be paid anything extra because he didn’t do what he told him to. Ray said it was a lesson he never forgot. The year Ray was a junior in high school, he and some friends decided they wanted to go on the senior trip even though they were not members of that class. At that time, Ray owned a 1950 Ford he bought from Lee and Lon Gilpatrick. The senior trip was to Fontana Village, North Carolina. Classmates Clifton Sells, Bobby Howell, and Bobby Boles when along with Ray in his Ford to North Carolina and got a cabin for one night at the same place where the seniors were staying. I asked him why they only stayed one night, and his answer was that more than likely, they only had enough money to stay just one night. On the way home the next day, they had a blow out on the car. When Priscilla Copeland (everyone knows as Pat) was a freshman and Ray was a junior in high school, they began dating. This was also the year that Ray went into debt for his first dump truck. The truck cost a whopping $2,500.00 and had a V-8 engine, a first for this area. He used the truck to haul rock to stock piles around the area for the highway department. He was paid twenty-five cents per ton. His senior year, he hired Junior Copeland to drive the truck for him while he finished school. When Ray was 18 and Pat was just 16, the high school sweethearts eloped to Georgia to get married. Ray sold his car and a motorcycle in order to buy their wedding rings and make the trip to Georgia. He got $750.00 for both the car and the motorcycle. It was his dad’s car that the cherry bomb went off in they used to drive to Georgia to get married. After Ray and Pat settled into married life and as time went on, must of the work Ray did required him to be away from home and family much of the time. Over the years include his employment included a job with CFW Construction Company, a partnership with Lib Gore in Gore and Austin Paving, and then lastly, a partnership with Tom Greenwood building homes. In 2006, Ray decided it was time to retire. Pat Austin is the daughter of Hasker (Hack) Copeland and wife Nora Anna Hodges Copeland. Pat’s mother died when she was only thirteen, leaving her father with the job of raising his daughter by himself. Hack will be remembered by many people in this area for his outstanding carpenter skills. Many homes in this area have cabinets that were specially crafted by his talented hands. After Pat and Ray married, she worked at the shirt factory in Livingston for a short time, and following the birth of their first child, Tammy, she went to beauty school. She got a job at Marian’s shop on Church Street and worked there for a while. When the Austin family grew to include two other daughters, Amanda and Beth, and then a son, Michael, Pat decided it was time she did something for herself and enrolled in college at Tennessee Tech. In 1978, she graduated from Tech, the same year their daughter, Tammy graduated from high school, and their daughter, Amanda, graduated from the eighth grade. When Pat was 56 years old, she completed her Masters degree, and when she was 58, she received her Education Specialist Degree. Along with their mother, all four Austin children have a college education. Ray laughed when he said he had figured up the number of years he paid in order for his wife and the four children to get a college degree and that total came to 100 years. Hack Copeland was photographed while he was in service. His daughter, Pat, is shown here during her grade school days. Pat is also retired following a 25 year teaching and counseling career with the Overton County school system. But retirement for both Ray and Pat probably doesn’t mean the same thing as it might to other people. They are both probably just as busy now as they were when they worked away from home. Ray raises a big garden every year in addition to the time he still spends restoring cars and participating in soap box derby events with their grandchildren. If you see a strange looking vehicle around town, it’s probably Ray out for a drive in his 1954 Willis he recently bought in Algood. It’s definitely a car that requires a second look. Ray told me not too many of this type car were ever made. His love of motorcycles is still evident too. The day I went to the Austin home for an interview, a 1997 Harley Davidson sat in the driveway. It’s very obvious that the Austin family are very close knit and enjoy spending time together. For a number of years they have shared a hobby that began when the grandsons joined a scout organization and participated in a Pinewood Derby. From this, the family’s interest grew to include Soap Box Derby racing. Grandsons Dylan Loftis and Lucas Gunnels, along with granddaughter, Leah Gunnels, have participated annual soap box derby races in Cookeville where Lucas came in first place three times. The Austins have also entered the All American Soap Box Derby races held in Akron, Ohio each year. The entire family participates in the preparation and building of the soap box derby cars, something Grandpa Ray’s abilities really play a big part in. Recently, Ray has become involved in the hand crafting of special built soap box derby cars for special needs children. He, along with Lee Carney, owner of American Classic Mantle Company in Livingston, have spent many hours getting these cars ready to be used in races especially for these children. The cars are designed so that a special needs child can ride along with a driver who has previously participated in soap box derby races. Something else the Austin family has participated in together has been the 13 mile Country Music Marathon held in Nashville. Daughters Tammy and Beth, daughter-in-law, Lori, grandson Lucas, Ray, and Pat have all taken part and completed this race. For as long as Ray can remember, he has been interested in automobiles. That interest includes a fondness for Mustangs. He has rebuilt two of these special cars that are now owned by two of his daughters. In 1994, he and Pat attended the 30th Mustang Anniversary event held at the Charlotte Speedway in Charlotte, North Carolina. Also in attendance was former President Bill Clinton who also shares an interest in Mustangs. Both Pat and Ray had the opportunity to meet and shake hands with the President at that event. Both Ray and Pat believe the thing they are the most proud of about their family is the fact that they are members of and very actively involved in the Netherland Church of Christ in Rickman where their son-in-law, Mark Loftis, is the minister. On Sundays when all fifteen family members are present, they take up two whole pews. It’s been fun looking back at the life of someone who not only drove long before most everyone else his age did, but actually owned his first car when he was only in the eighth grade. Had he not been blessed with those natural abilities to be able to take a car completely apart and put it back together again, who knows what path he would have gone down if life. If his interest had not been in cars when he was young, going on the senior trip to North Carolina even though he wasn’t even in that class would be a memory he and those other classmates would not be able to share and laugh about today. Thanks to both Ray and Pat for sharing these good memories.